Luther is . . . beautiful. 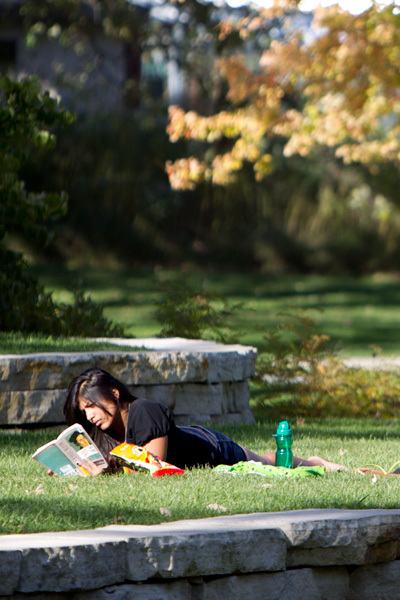 Our campus is full of curving paths and sunlit clearings that showcase the area’s natural beauty—from woodlands to prairies to bluffs to the sparkling Upper Iowa River. We also have almost 800 acres of natural areas that students can explore—by paddling the river in the lush height of summer, watching the gorgeous fall colors spread across the bluffs in autumn, snowshoeing or skiing our trails in the glittering winter, and hiking those same trails when the world starts to warm again in spring. At Luther, there’s no escaping the beauty. Even our football stadium was named by USA Weekend as one of the four prettiest places in the country to watch a game.